Since 2009 Oyster Bay Manor has welcomed thousands of guests from all over the world. A private tree lined driveway leads to the house which is located on a beautiful 2/3 acre private park-like waterfront property. Within easy reach of downtown Seattle, we're also close to world-class golf courses, an eclectic collection of communities and endless recreational, cultural and scenic discoveries. Step back in time with this elegant 1937 brick manor with original features of mahogany trim, leaded glass windows and doors, and hardwood floors throughout. The entertainment size great room is warmed by exquisite marbled plaster and hand painted coffer ceilings. Large picture windows frame the beautiful views of mature gardens and the shoreline of beautiful Oyster Bay. Our location is excellent! ... we're just 17 miles West of downtown Seattle. One can take the local commuter ferry, (drive, or walk on) it runs typically on the hour from 4:30 am thru Midnight and brings you to the heart of downtown Seattle in about 50 minutes. The ferry is just an option, one can also drive directly to Seattle, and SeaTac International airport via Hwy I-5 in just under an hour. We're a unique waterfront property with our own (about 70 ft.) private beach that's use is exclusive for our guests. We have a couple of sit on top single Kayaks on hand that are free for our guests to use during their stay. In addition, we have life jackets and paddles.The beach access is from the property, and the bay is quite calm, so it's possible to Kayak year round. Drive directly, or take the local commuter ferry to DT Seattle. The commuter ferry is considered a 'not to be missed' Seattle experience. Article from Travel Magazine: Title The World's Most Scenic Ferry Rides Washington State Ferry Seattle's island-clogged Puget Sound makes ferry travel to and from Seattle a way of life. It’s no surprise that Washington State Ferry, part of the Washington State Department of Transportation, is the largest ferry fleet in the United States, and the third largest operator in the world, carrying more than 23 million passengers a year. 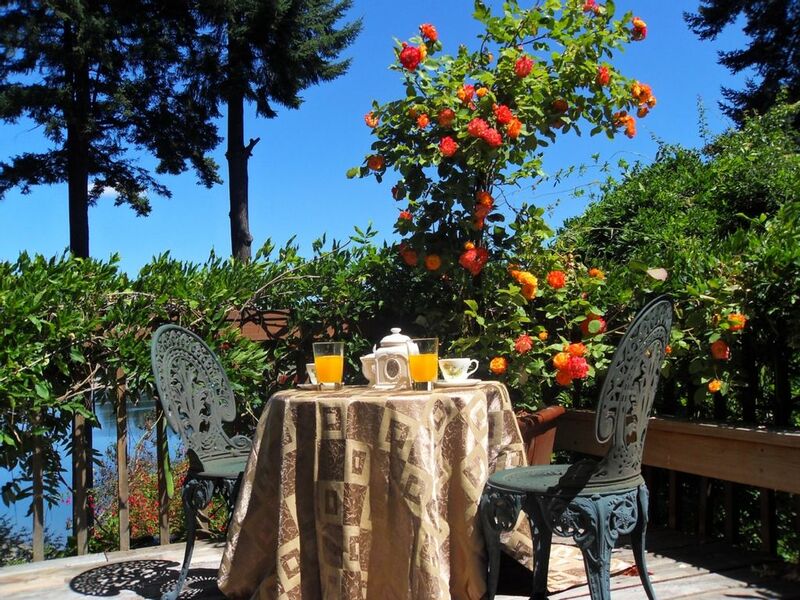 For visitors, the breathtakingly gorgeous commute to the Kitsap Peninsula, where you can stroll the waterfront, dine in style, tour a vineyard, or rent a bike is a must. The Kitsap Peninsula lies in the heart of Puget Sound, and is surrounded by over 300 miles of saltwater shoreline and located between the Olympic and Cascade Mountain ranges in Washington State. Kitsap offers miles of accessible shoreline, world-class golf courses, an eclectic collection of communities and endless recreational, cultural and scenic discoveries. Many restaurants, amenities, and attractions are within a few minutes of the house. Including cups, glasses, plates, bowls, pots, pans, baking pans ,roasting pans, Casserole pots etc. This is real find in great accommodations. The house is tucked away right off of Kitsap Way with a secluded driveway entrance cut into thick woods... very cool just to drive in... but wait, it gets better. The 3 level rustic brick house is stunning nestled in the trees... very private, yet 2 to 3 blocks from restaurants and grocery store. Inside is really beautiful... hardwood floors, large area carpets, gourmet kitchen, fireplace in living room, game room downstairs... the large deck off the kitchen looks out on Oyster Bay, with kayaks provided. The bedrooms and bathrooms... the whole house looks like something from a Hallmark Channel movie!!! Beautiful architecture all over the place!! Rod (owner) and Tammy (property manager) were fantastic to work with to make our stay happen. Great place in a great setting!!! This is a very nice house with a very comfortable living room and a pleasant view of lake-like Oyster Bay. But it is a very old house. If you are not used to the clanging and hissing of an old radiator system, you may -- like us -- find yourself waking up frequently through the night. And if you are over 5.5 feet, you will need to be on guard due to the curved dormer ceilings upstairs. The kitchen was functional but there is a quantum difference between a VRBO that is dedicated to vacation rentals and a home, like this, that has the feel that the owner vacated for a few days, not least in how the kitchen is equipped. It fronts onto a four-lane highway (though you can't hear it from the house) with an unmarked driveway, so finding it the first (or second) time is a challenge, as is getting out of the driveway onto the busy road. Thank you for your review and mentioning that it is a very nice quiet comfortable home with a pleasant view of the bay. Built in 1937 it's definitely not a cookie cutter new home although it does have pretty much all the amenities of a new home including recent updates that include a new kitchen that is fully equipped (all kitchen Items are written in listing.) The heat is radiant steam heat so it will make a little noise comparable to an air conditioner, although it's not constant. I did follow up with you when you checked in to make sure everything was good, but you never replied. Had you replied, I would have mentioned that for light sleepers each radiator can be turned off individually in each room when you go to bed at night. The room is going to hold most of it's heat throughout the night. Additionally, I do have a electric space heater that could have been used in the room. Just to let you know Oyster Bay Manor has been a dedicated turnkey vacation rental since 2009, we do have a 98.6 percent 5 star guest overall approval rating. There are no personal items whatsoever in the house or photographs other than a few photos of the construction and original owner (no relation) from the 1930's. I apologise if you felt these items were personal family pictures. This historic house was perfect for 5 adults and 1 infant. It was secluded, yet easy to access. The view and back yard were stunning and serene. A 1hour ferry ride into downtown Seattle. Owner had addressed a plumbing problem before we even got there and we had no other issues during our stay. This is a Marvelous spot! We really enjoyed our stay at The Oyster Bay Manor. Booking was easy with Rod, Tammie came and met us at the house and was wonderful and we just relaxed and enjoyed the setting and the kayaks! Will definitely rent again! This home was perfect for our family vacation. My husband and I took our 4 grandchildren to Seattle for our annual family vacation. The kids loved kayaking on the bay. The view of the bay was absolutely beautiful. Tammy was so kind to welcome us and give us a tour of the house. The house was very clean and quiet. The location was very convenient to grocery stores and the ferry terminal was just a few miles down the road. Ferry was easy to take to Seattle. Tony's Pizza was a great recommendation from Tammy and Rod. We would highly recommend this home! Thank you Rod and Tammy! We could not have chosen a better home! The home was everything we expected! The property was beautiful and this was the perfect time to visit. The Wisteria was in bloom along with several other beautiful plants. Great view of the Bay. Update: New Fast Ferry Service to heart of Downtown Seattle (Pike Place Market area) in 28 minutes starts July 2017!! Our central location is excellent! We're just 16 miles West of downtown Seattle. One can take the local commuter ferry which is just 5 minutes from the house. It's free to walk on from the Kitsap side, (you can also drive on) and leaves typically once an hour from 5am thru midnight. A great way to reach downtown, the ferry with a cafe and WiFi on board, provides a relaxing, and authentic Seattle experience. The panoramic views from the ferry of downtown Seattle as you arrive are definitely not to be missed. You'll arrive in downtown Seattle at pier 52 in about 50 minutes and be within walking distance of most of Seattle's major attractions such as Pike place Market, Safeco Field, Century Link Field, Space Needle, Waterfront Park etc. The ferry is just an option, you can also drive directly to Seattle via Hwy I-5 in just under an hour. Oyster Bay Manor Rental Agreement: By making a reservation/booking you agree and accept the following terms and conditions: The $400.00 reservation fee that is charged at time of booking is non refundable. Balance owing on your rental fee for stay must be paid no later than 60 days prior to stay (100 percent refundable up to 60 days prior to stay if paid early) and is non refundable within 60 days of stay.